A few months ago, my particular Twitter circle of friends was all agog over Smitten Kitchen's Salted Brown Butter Crispy Treats. I mean, they were nuts for them, eating them by the panful. Well, I finally got around to making them myself, and I must concur, they are delicious. However. Last night Andrew made a slight but amazing modification, and I felt it was my RESPONSIBILITY to share it with everyone. 1. Make Smitten Kitchen's recipe. 2. Cut off a piece. 3. Melt some semi-sweet chocolate chips and smear them on top. 4. Put some sweetened dried cranberries (eg, Craisins) on top of that. 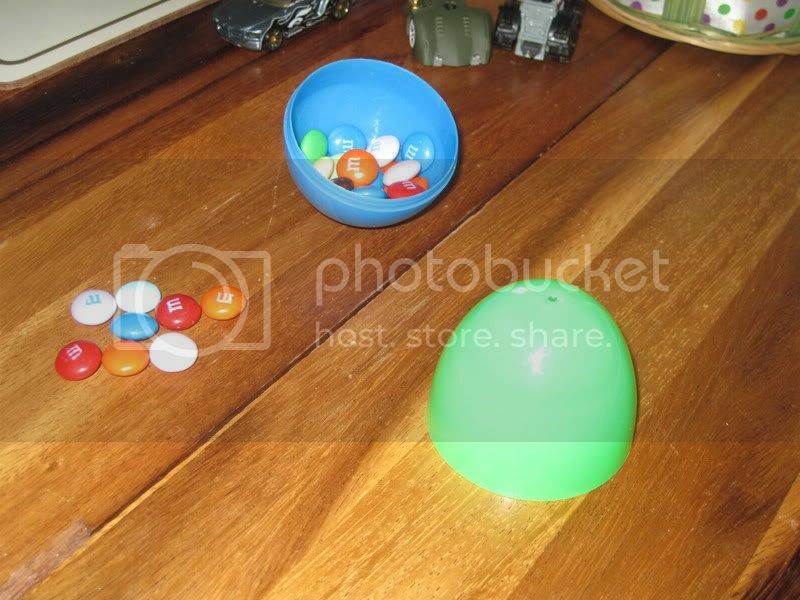 JACK (entering the kitchen while wiping his mouth and holding an empty half-a-plastic-egg): Mom, did you say I could eat the M&M's out of this? ME: No, I said you could only eat the ones you took OUT of the egg, not the rest. Now that Jack has discovered the joys of borrowing DVDs from the library, we watch a lot of shows that way. Well, he does. 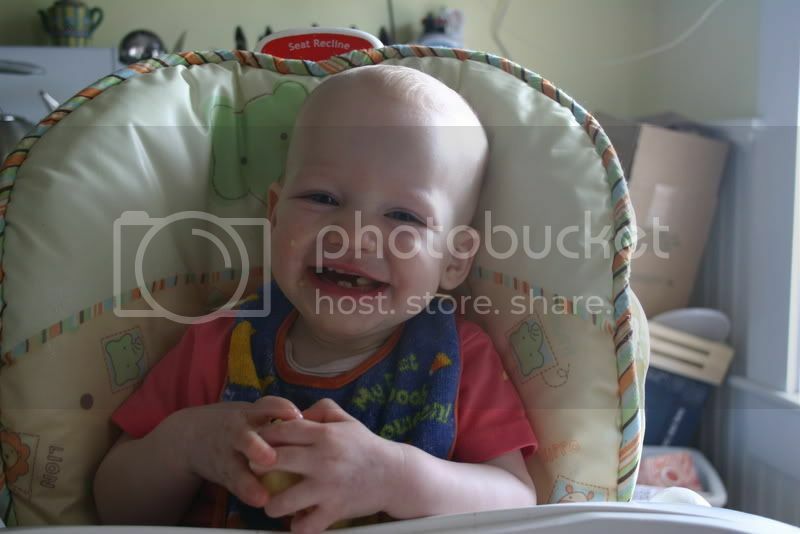 His particular favorites of the moment are The Mickey Mouse Clubhouse and a Canadian television show, Mighty Machines. It’s video of actual trucks with voiceovers that are supposed to be the trucks personas. It’s pretty cute, actually. Mickey Mouse is a new favorite, but we’ve been watching Mighty Machines for several weeks now, long enough for the theme song to have become a regular in the nightly lullaby lineup. You can imagine how this is an ordeal I would rather avoid when I’ve got raw chicken on the counter, oil heating in the pan, and a baby on the floor whining and crying for HER dinner while skooching towards the outlets. So when Jack asked for Mighty Machines the other day, I said, “Why don’t we see which Martha Speaks it is first?” and I turned it on. This is a trick that often works; once he SEES a show he likes he will change his mind. However. I usually say, “Is this OK?” and get a nod of assent before I leave the room, but this time I just took in his absorbed expression and went back to the kitchen without saying anything. I gotta tell ya, it was pretty hard not to laugh in his face. I lamely tried to defend myself – because, let’s face it, I did trick him – but dinner wasn’t ready anyway, so I made amends by putting in Mighty Machines. I don’t know why, but I could watch that show all day. A weird side-effect of preschool is the way Jack learns things that I don’t teach him. Wait, it sounds wrong to call that a side-effect – “He’s learning things! At school! How strange!” – but I’m talking about pop culture, like the way he joyously identified and selected the Mickey Mouse underpants when we went to Target to replenish his stock despite our never having exposed him to anything Mickey-related in any way. Now, it’s not that I’m opposed to Disney, exactly, but sometimes Disney does seem a bit… Big Brother-y to me, and I was fine with postponing the inevitable for as long as possible. Which, as it turns out, is about three and a half years. This is what happens when a scooching baby sits on a lid. *Note: I am not actually going to put wheels on that thing. 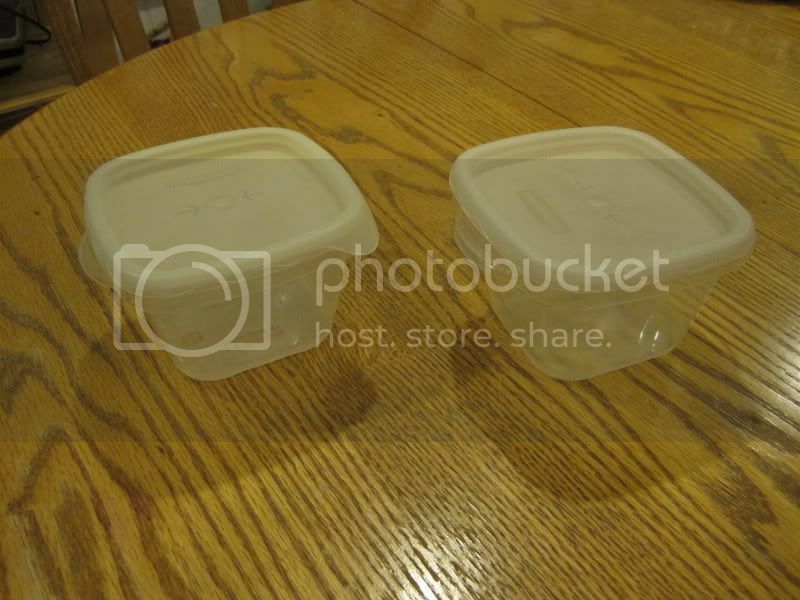 Containers with matching lids are purchased. 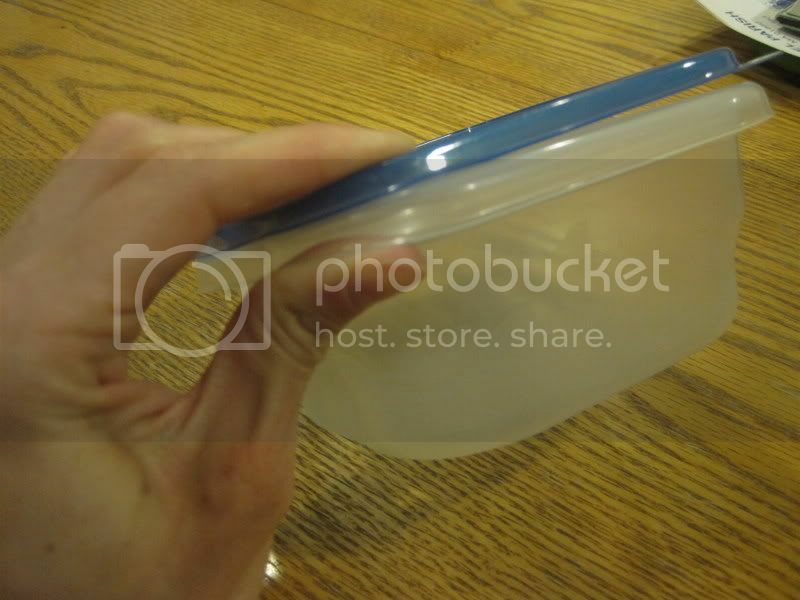 Lids and containers are stacked for easy storage. 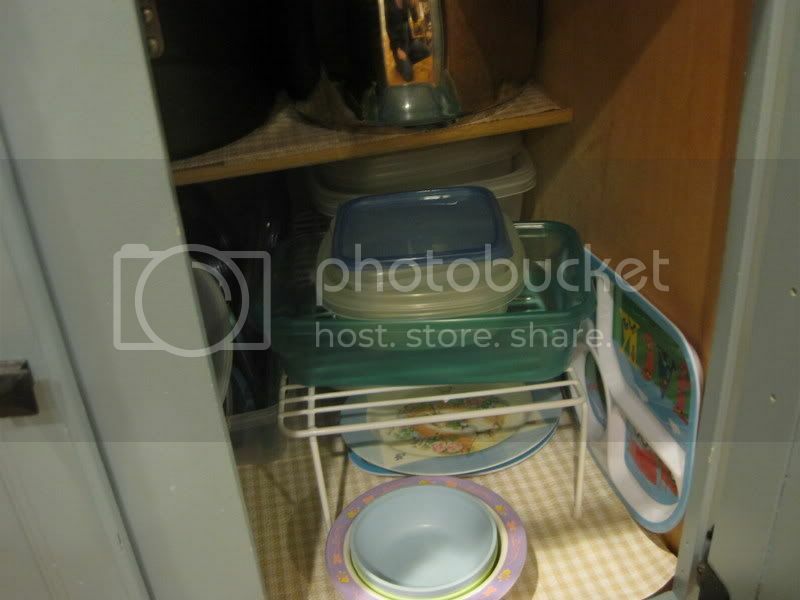 Stacked items are placed in the Tupperware cabinet. 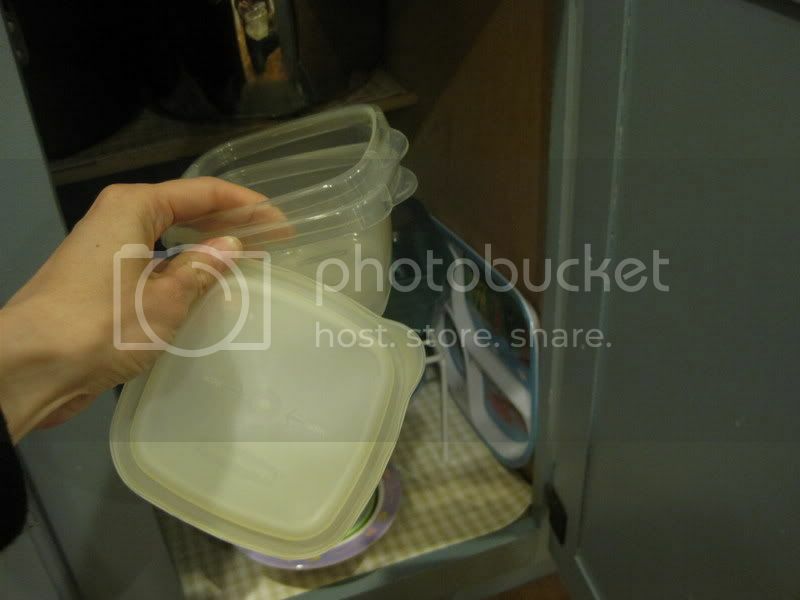 In the absence of light, the lids and containers begin to migrate away from one another. 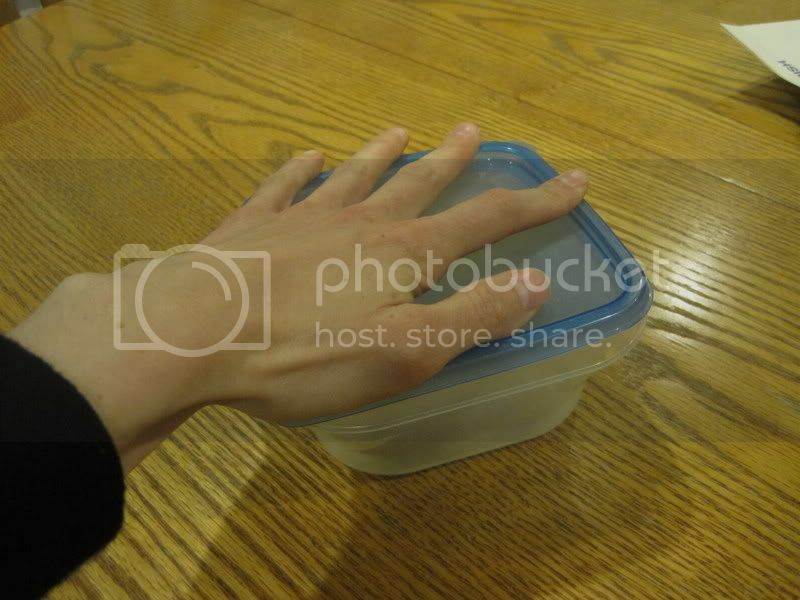 Within a few days, the original lids and containers mate, produce an offspring, and die. 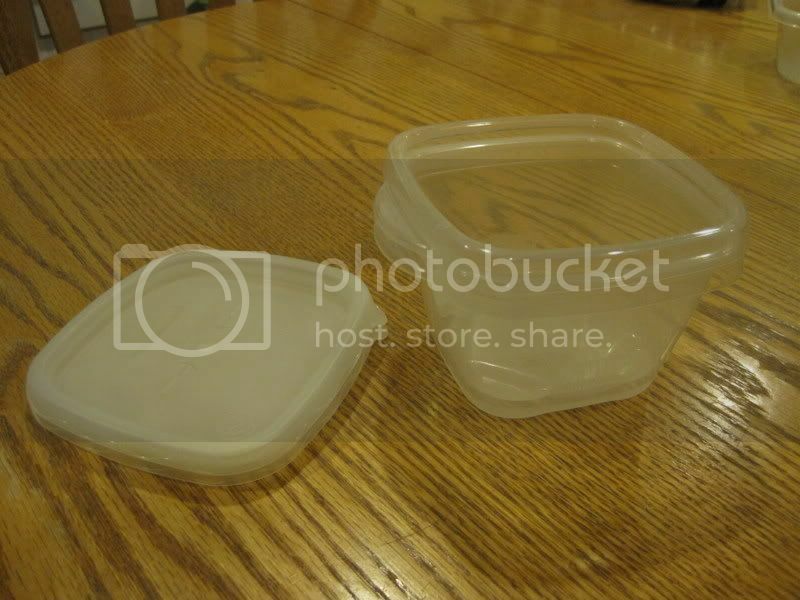 Upon death, Tupperware containers disintegrate into a powder which resembles ground graham cracker crumbs. The offspring is always a different size than its parents; ie, two six-inch circular lids can mate and produce a 4-inch circular lid. Sometimes the offspring is a different shape entirely, so two square lids can produce a rectangular lid. 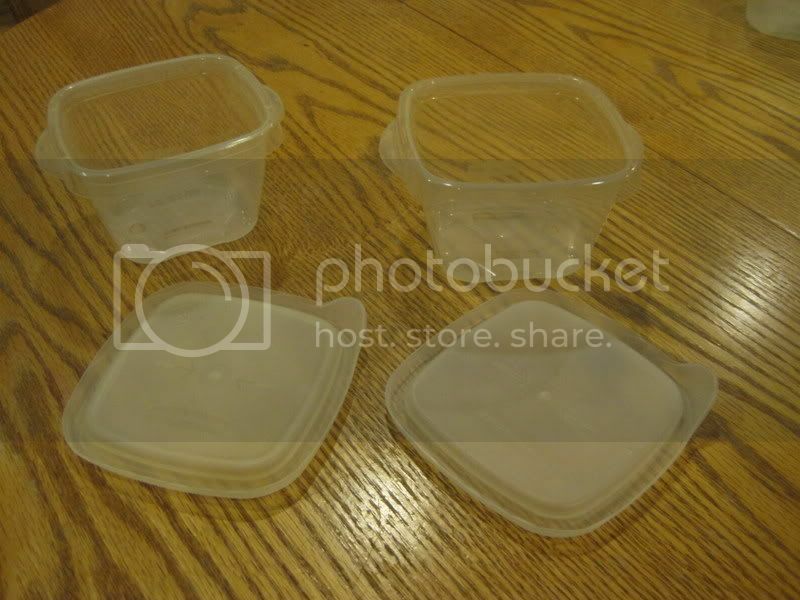 In an interesting twist, however, the most common combination of lid- and container-offspring results in similar shapes but ever so slightly different sizes. 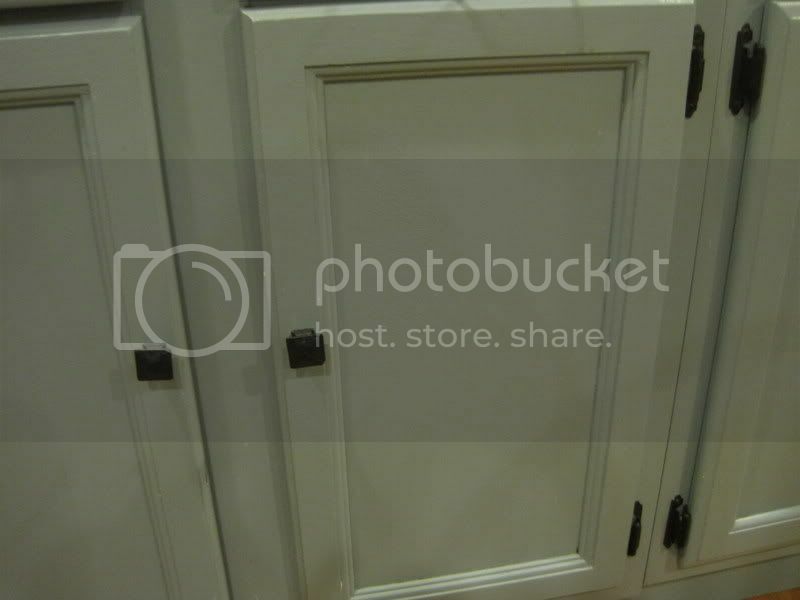 If enough time is allowed to elapse, the Tupperware cabinet will eventually contain hundreds of containers and lids no one can remember purchasing, and none of which fit together. Her center bottom two teeth came in first, like any normal baby's. Then her top right eyetooth. Her top right center tooth broke through next, dashing my hopes of a vampire fang-baby. I was really hoping for a vampire fang-baby. 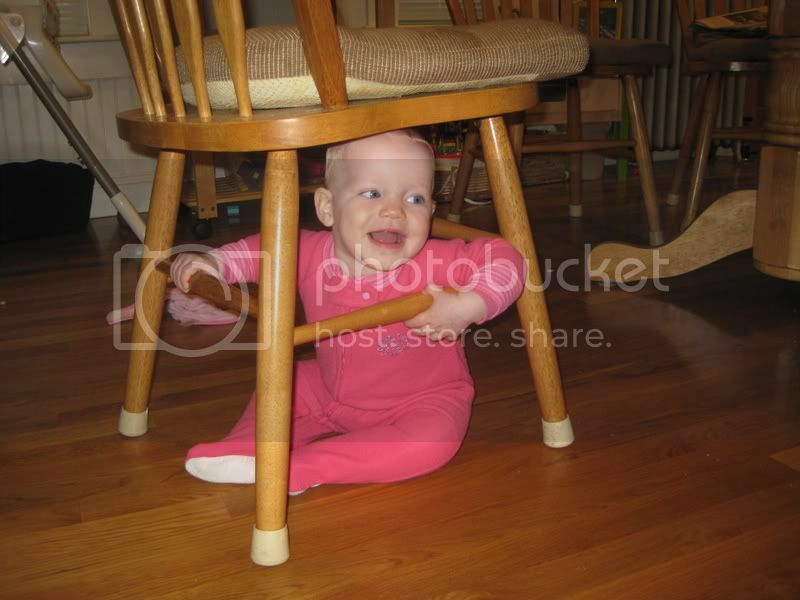 In unrelated news, Nora got herself stuck under the kitchen chair this morning. Andrew went to release her immediately, but I made him wait until I took a picture. You're welcome. Yesterday evening, Andrew and I decided to institute a policy that I would handle all baby wake-ups until midnight and then again from 5am on, because this nighttime nursing thing has gotten ridiculous. We're getting enough sleep to manage, but that's because I fall asleep in the chair and she nurses and nurses and nurses for HOURS in the night. She's nine months old. This is unnecessary. Lately, she's been waking up lately for a quick nursing session around 10:30 or 11:00 which is no big deal, and by 5am, she's legitimately hungry again. So the immediate plan is to just get rid of the 1-4 am sessions. Guess what time she woke up last night? Go ahead. Guess. For the past few days, Jack has been going about town with two imaginary crocodiles. They are his pets. I think he got the idea from Dora, Dora and Boots often have to cross Crocodile Lake, and crocodiles have been chasing US for a few weeks now, usually on our way to and from the car. And then sometimes they turned out to be NICE crocodiles and would be invited for lunch or what have you, and then on Wednesday they started to get buckled into the car and were granted names. Baby and Bopie. On Thursday, we discovered that Baby is going to have a baby! In a few weeks! Or days! The timeline seemed to shift! Today I was informed that Baby is going to have her baby TODAY, but that she does not have to go to the hopsital [sic] because she is a crocodile. It's all pretty adorable, I just wish I didn't ALWAYS have to do the talking for the crocodiles. "Mom, make the crocodiles say, 'What are you doing, Jack?'" etc. Do you know what waking up at the sinfully late hour of 6:30am to a gorgeous, warm sunny day after a great night of almost completely uninterrupted sleep will do for a person's mood?